Dried cranberries are great on their own, on salads, with granola or yogurt, or included in breads, muffins, and other baked goods. They are easiest to make in a dehydrator but can also be successfully dried in your oven. Before you can dry the berries, you must blanch and sweeten them. Then place them on racks over baking sheets, well separated to allow for maximum air circulation around them. Wash the cranberries. Place them in a large metal bowl or pot and pour boiling water over them. Let them soak in the hot water for 10 minutes. They should "pop" or split open, but don't worry if there are a few duds that didn't. We'll take care of those a bit later. Drain the cranberries in a colander, then gently wrap them in a clean dish towel to get rid of as much of the water clinging to them as possible. Combine the cranberries with a simple sugar syrup made with 2 parts water to 1 part sugar. You'll need 1/4 cup of simple syrup for 12 ounces of cranberries (the amount usually found in commercially sold bags of cranberries). You can omit this step if you wish, but keep in mind that likely every "craisin" you've ever tasted from commercial brands was sweetened. Unsweetened cranberries are likely to be sour and astringent. Set a rack on a baking sheet. Cover it with two layers of paper towels and a sheet of parchment paper. Put the blanched, sweetened cranberries on the covered rack. Leave about 1/4 inch of space in between the berries on all sides so that air can circulate between the fruits. As you're setting the cranberries in place, notice whether any of them did not split during their 10-minute soak in hot water. Pierce those that didn't split with the tip of a paring knife before adding them to the covered rack. Use additional baking sheets, racks, paper towels, and parchment paper as needed to hold your remaining cranberries. Allow 8 hours for the berries to dry in an oven set as low as it will go. Let them cool before testing for dryness. Turn the oven on to its lowest setting. On many ovens, this is 150 F. (135 F would be ideal if your oven goes that low.) Put the baking sheet of cranberries in the oven 8 hours or overnight. Check the cranberries after 8 hours. They should be fully dry but still somewhat leathery or pliable. You won't be completely sure if the cranberries are fully dehydrated until they have cooled. (You know how cookies crisp up after you take them out of the oven? Same deal with dried fruit.) Once you think they are dry, turn off the oven and take out the cranberries. Let them cool for 20 to 30 minutes. After the cooling-off period, tear one of the berries in half: There should be no visible moisture along the break. Even after the cranberries are correctly dried, there may still be some residual moisture in the fruit that you can't feel. This shouldn't be enough to prevent the fruit from being safely preserved and mold-free. But you'll have a tastier, better product if you "condition" the dried fruit. Put the dried, cooled cranberries into glass jars or BPA-free food storage containers, filling the jars only about 2/3 full. Cover the jars. Shake the jars a couple of times a day for one week. This redistributes the berries as well as any moisture they may still contain. If any condensation shows up on the sides of the jars, your fruit isn't dried well enough yet and it needs to go back into the dehydrator for a few hours. 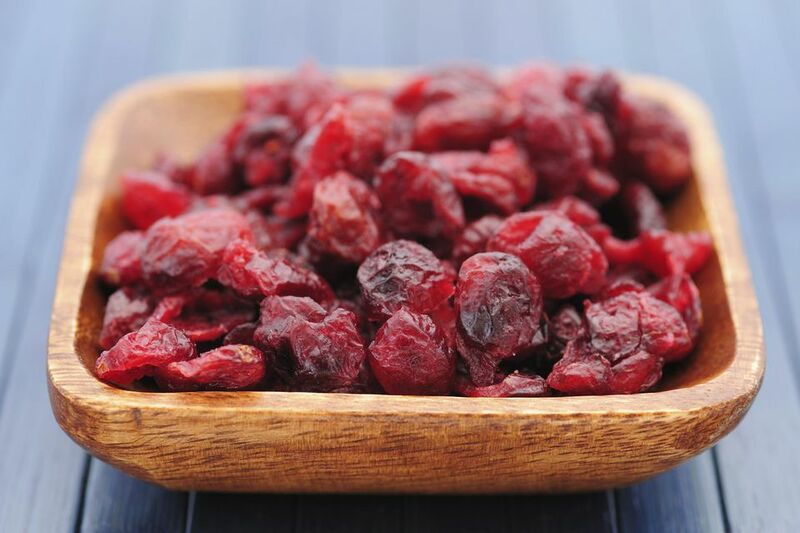 Once your dried cranberries are conditioned, store them in airtight containers away from direct light or heat. It's OK to fully fill the jars at this point; the 2/3 full was just for the conditioning phase when you needed to be able to shake the pieces around.